Frito-Lay offers new Doritos HeatWave tortilla chips this summer featuring a taste that transitions from savory to a bold spicy kick. The chips come in two varieties: Chipotle Cream and BBQ. Both end with fiery heat, hence the "HeatWave" name. 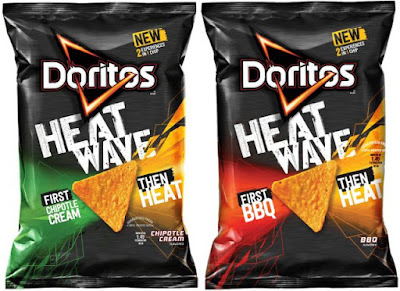 You can find Doritos HeatWave in 9.25-oz bags for a suggested price of $4.29 and in 3-oz bags with a suggested price of $1.69, while supplies last.